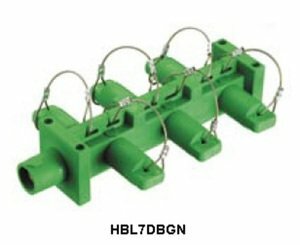 Hubbell single pole distribution block. 1-Male to 6-Female connection. UL and cUL listed. Black color. If you have any questions about this product by Hubbell Wiring Systems, contact us by completing and submitting the form below. If you are looking for a specif part number, please include it with your message. Wiegmann RHC362412 RHC-Series NEMA 3R Rainproof Hinge Cover Wall-Mount Enclosure, Carbon Steel, Medium, 36" x 24" x 12"
Hoffman A12106CHNFSS6 J Box, NEMA 4X, Hinged Cover, Stainless Steel Type 316L, 12.00" x 10.00" x 6.00"
Hoffman A1008NFAL J Box, NEMA 4X, Clamp Cover, Aluminum, 10.00" x 8.00" x 4.00"